Additional information may be found at http://www.fwcaz.com/. Come Visit our Booth at HVACR Week 2010! Come visit us at the Comfortech Show in Baltimore on September 23rd and 24th. Check out our new Dynacycle Recovery Cylinder. Click here to register or to find out more about the show. Author Brad KivlanPosted on September 22, 2010 October 25, 2016 Categories DynaCycleLeave a comment on Come Visit our Booth at HVACR Week 2010! 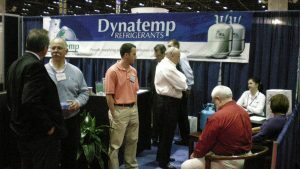 Dynatemp International launched their new DYNACYCLE refrigerant recycling program at the AHR Expo last week. Wholesale partners were excited about the program’s ability to build customer loyalty and increase overall sales. Contractors like the idea of turning a cost center into a profit center. Our first contractor kickoff meetings are already scheduled for March! The AHR Expo is the world’s largest HVAC&R trade show event for professionals to buy, sell, network and learn. Visit Dynatemp at Booth #1919 to discover what our products can do for your business. AHR Expo in Orlando Florida, January 25-27, 2010.